Four black girls were murdered in a church bombing in Birmingham, Ala., on a Sunday in 1963. That day, civil rights activist Diane Nash and her then-husband activist James Bevel decided they had to do something. The couple would develop the initial strategy for what became the Selma voting rights campaign. Nash reasoned that if blacks could vote, they would be in a better position to protect their children from racist violence. “And so that afternoon, we decided that no matter how long it took we were going to get the right to vote for blacks in Alabama,” said Nash, who grew up in Chicago and lives here now. The campaign culminated in the passing of the Voting Rights Act of 1965, abolishing discriminatory literacy tests and poll taxes that had been used to disenfranchise African-American voters. Nash, now 76, was a founding member of the Student Nonviolent Coordinating Committee and a Southern Christian Leadership Conference field staff organizer. She often risked arrest and incarceration while playing a leading role in desegregating lunch counters and interstate buses and bus terminals. She also was at the forefront of the voting rights campaign in Selma. Nash is scheduled to attend an event honoring the Selma to Montgomery March and other milestones in the civil rights and black liberation movements with other leaders and participants. The conference will be held Friday, Feb. 20 and Saturday, Feb. 21 at the St. Clair Drake Center for African and African American Studies at 430 S. Michigan Avenue in Chicago. Nash is expected to give a salutation at the plenary session at 10 am Friday. For more information, call (773) 702-8288 or email osp-cp@uchicago.edu. With the 50th anniversary of the Selma campaign approaching, The Chicago Reporter sat down with Nash to discuss her civil rights activism and what she feels passionate about today. What led you to become one of the few women at the forefront of the civil rights movement? I was on the Student Central Committee in Nashville, Tennessee, which consisted of about 30 representatives of each of the colleges and universities in the metropolitan area that were participating in the sit-in movement to desegregate restaurants and lunch counters. I was the third chairperson. The first two were men. You have to remember that was before the women’s movement. It was pretty much taken for granted that the presidents or the chairmen of organizations would be men. The first two chairmen missed meetings and demonstrations and when they came back, we asked them where they’d been, and both said that they had been studying. We thought someone could get killed or seriously injured if we did not have efficient officers. When they came back, we thanked them for their service and replaced them. By the time they elected me, we had worked together for a few weeks and people thought that I was efficient. I did not want to be chairperson. I was afraid to be chairperson. I declined, and they insisted, and I finally gave in and agreed to it. I did not have any problems with gender issues then. Later on, I did. What issues did you face later on as a woman? I was one of the founding students of the Student Nonviolent Coordinating Committee. The Nashville contingency, of which I was a part, had a very thorough education in the practice and philosophy of nonviolence. I was the only woman elected to that committee. The other students, who were men, did not have the background in non-violence and were very eager to get close to the Kennedy administration. On the other hand, I was very determined to keep the student movement independent of the Kennedy administration. I think [the male students] regarded me as a pain in the neck. And they had a good ole boys’ attitude so that was difficult for me. I let them put me under such pressure that I started getting dizzy. The Kennedy administration wanted to end direct action because pictures of burning buses and violence were being circulated around the world. I thought it would be ridiculous to not be independent of them. 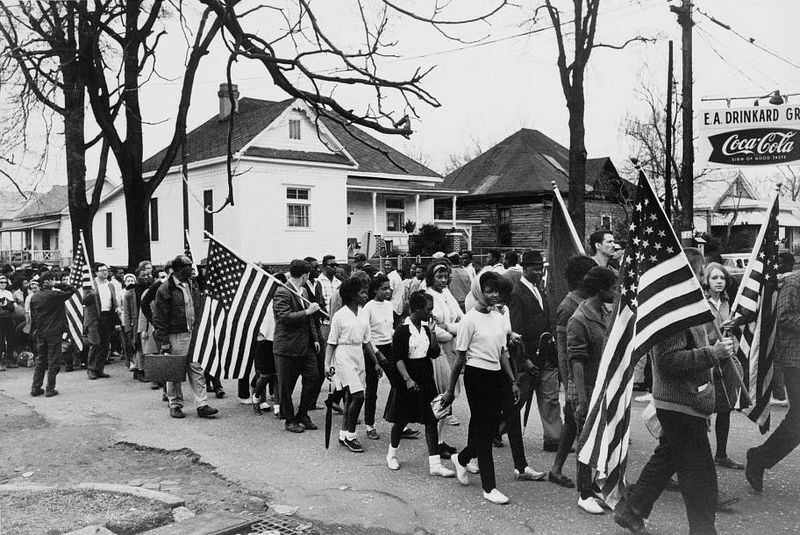 How were you able to overcome violence and adversity during the civil rights movement? Well, we didn’t overcome it. They still perpetrated the violence. I think at that time, blacks were able to confront it because segregation was so humiliating and degrading and dehumanizing. And I think after having been under segregated systems for the better part of 100 years, blacks were so fed up with it that we were willing to do whatever was necessary to overcome it. Part of our nonviolent training was to understand that putting us in prison and in jail was for the purpose of breaking our spirits. And so, I guess I understood why I was there, as did all the students who were arrested. We knew we were put there unjustly. So between setting up schedules for ourselves—­­singing, meditating and praying, a lot of camaraderie—we maintained very good spirits. We just knew that this is one of the things that would have to be done to eliminate segregation. Why did you get so deeply involved in political activism? Every time I obeyed a segregation rule, I felt like I was agreeing that I was too inferior to use the front door or a segregated facility. And it was humiliating. If you went downtown in Nashville around lunchtime, the blacks that worked in the area would be sitting on the curbs near the alleys eating lunch that they had either brought from home or purchased from a restaurant on a takeout basis. That was degrading. I couldn’t even go downtown to get off campus with a girlfriend so we could treat ourselves to cheap lunch at the 5 and 10 cent store or Walgreens. That was a period of time in my life where I was interested in doing new things and going new places and meeting new people and just expanding my horizons. And segregation had the opposite effect. It was very limiting. Blacks couldn’t use libraries, hotels, public parks, swimming pools. There were many limitations and I resented that. I decided to find an organization that was trying to eliminate segregation. I looked unsuccessfully for a while, and then I learned about Reverend James Lawson’s workshops. He had been to India and studied Gandhi’s movement firsthand. He was also a conscientious objector and had spent time in prison for refusing to go to the Korean War. He was offering these workshops in Nashville at a local church once a week to the community and students and training us in the philosophy and strategy of non-violence. So I started going to workshops and got involved. What issues are you passionate about today? I still believe in democracy, as I did when we were getting the right to vote. I am really concerned about the need to get money out of political campaigns. I think we have lost our government of, for and by the people. We now have governments of, by and for the corporations. I think U.S. citizens need to realize that they cannot depend on elected officials to do what is necessary in the interest of this country. And we have to take the future of this country into our own hands. I often say: suppose we had waited for elected officials to desegregate lunch counters, restaurants, buses and get the right to vote in the south. I think now, 50 years later, we would still be waiting. And I think that citizens don’t understand that they need to take the future of the country into our own hands, and I think using non-violence is a powerful way to do that. Fifty years from now, the things that need to be done will not be done. I think it will be very unfortunate for our grandchildren and generations to come. What does the 50th anniversary of Selma mean to you? Fifty years ago, I would’ve hoped that voting rights would not even be an issue now. It’s unfortunate that there are people now who want to deny voting rights that were so hard fought for. The mass protest against violence will only be effective with repetition, negotiation and voting for specific demands. Even after slavery was abolished, the forced labor of black Americans lived on. After aldermanic candidates were removed from the ballot, three more wards in Chicago’s City Council races were left with incumbent aldermen facing no opposition. Civil government is prominently Black” conservative…fighting gang violence selling narcotics! Oprah and Obama any suggestions using historical segregation popularity is there resolution to bigotry?